1) Music as motivation – Amir Johnson is right: putting on your favourite tunes is the ideal way to get in the right headspace for tackling a cleanup. Personally, I go with heavy metal for that extra edge; listening to punishing riffs whilst punishing dirt is how I roll. 2) Dust furniture before cleaning floors – This sounds like a no-brainer, but I can’t tell you how many times I’ve forgotten to dust first. It’s a sure-fire way to end up cleaning the floor all over again. So before you hit the floor, save yourself the unnecessary effort and grab a Swiffer Duster. It traps and locks up to three times more dust than a regular feather duster. So you’re assured of a good clean, top to bottom. 3) Don’t cut corners, aim for them – Approximately 99.9% of crumbs, dust and dirt can be found in corners. That’s not based on any kind of scientific research, just plain old experience. Unless you have huge dust bunnies slash tumbleweeds rolling around on your floor, corners are the culprit. So attack the edges, nooks and crannies with a Swiffer WetJet to ensure maximum dirt elimination. Its floor cleaner solutions are specially formulated to break up and dissolve tough messes. Then the thick WetJet pad traps and locks them away forever, sending a strong message to its dirty buddies that they’re not welcome on your floor. Got a particularly pesky patch? Try the powerful scrub strip – it’ll send those dried-on spots and messes to oblivion. Follow this handy advice and you’ll find yourself not only with a great “Man Clean”, but also some extra time to watch football or play Mario Kart or whatever it is you do with your precious free time. I’m not judging. 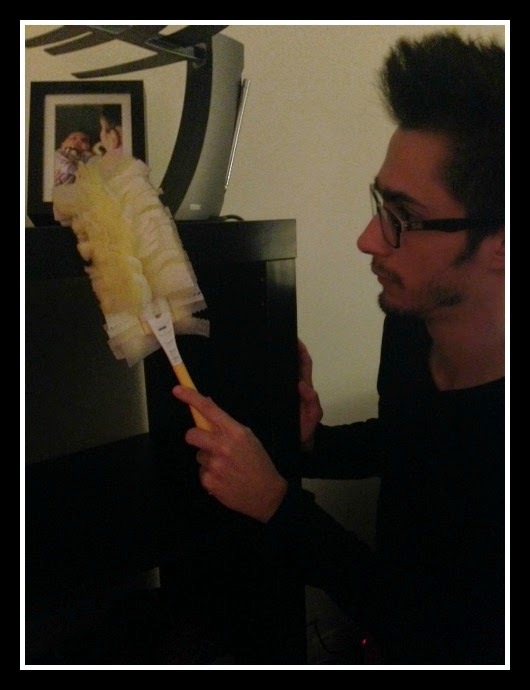 To learn more about the man clean movement and to get a Swiffer coupon, visit http://www.showyourclean.ca. By entering the following contest you are accepting that if you win your contact information will be shared with a P&G PR and shipping agency for the purpose of mailing your prize. Please allow 4-6 weeks from the contest closure date to receive your prize. This giveaway may appear on other blogs as part of the #PGmom program. However, to be fair, you can only win once per giveaway. If your name is chosen more than once, another winner will be selected. All winners must be from within Canada excluding Quebec. Valid entries only. Contest ends October 26th, 2014. For further contest rules, refer to the Terms and Conditions within the Rafflecopter. I use vinegar to clean most everything especially windows. Clean the bathroom while the kids are in the tub. Might as well use the time!! And scrub the tub once you pull the kids out as it's already full of water! Clean one area/room at a time, don't get ambitious and try to clean more than one area/room at a time! Never leave things laying around, clean up and put it away right away. I keep a clutter catcher (a fancy basket) on each floor of my house. At the end of the day I empty the baskets so clutter doesn't build up. Try and always keep up with the cleaning. I find when you do its easier!! My tip is to clean when you can - for example when the kids are bathing and you are watching them, you could clean the bathroom while watching them. orange zest in a little vinegar and water combo will make things clean and smell great. Clean up your mess right away and then go on to the next room. Clean as you go and its always easier in the end! keep the house tidy and clean every day,so its never a big job! I enlist my son, he's just the right height to clean lower shelves use the swiffer and fold his laundry. Don't try to tackle a huge mess or reorganization project in one go. I boil a cup of lemon water in the microwave, then it is just so easy to wipe out leavving it clean and fresh! Clean as you go so you do't have a big mess! I use vinegar mixed with dawn dish soap as my cleaner. Cleans everything. Keep the cleaning wipes handy, they are amazing for quick touch ups, wiping off handprints, light switches etc. I have found water and ammonia in a spray bottle the best window cleaner. And I use a old cotton t shirts so no lint. And no streaks. Use vinegar on your floors as it leaves them super clean! I use vinegar to clean the windows, sink and microwave. I microwave my dishwashing cloth in a bowl with some vinegar to kill the germs in it but it also makes the microwave really easy to wipe clean. Clean up after yourself regularly -- it makes a "big clean" easier. I keep a full set of cleaning supplies on each floor. That way I can easily grab what I need for a two minute clean up. When cleaning, have all the supplies you need on hand...makes getting it done much easier. My tip is to try to pick up regularly making cleaning not so bad. The only tip I have is stay on top of things--don't let it pile up. use glad press and seal on the shelves of your fridge and when it's time to clean just peel it off. nice and clean and ready to go again! Do a little cleaning every day. You don't get overwhelmed. 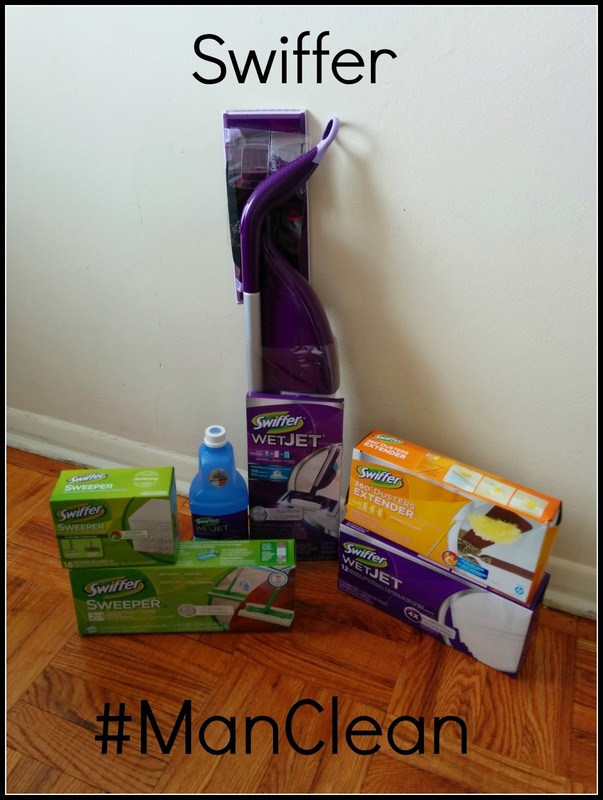 It would be great to win an Ultimate Swiffer Man Clean Kit. In response to your requirement to Share a cleaning tip. (denture or antacid) in between scourings. A can of cola dumped in for one hour also does the trick. The phosphoric acid in this mixture removes rust rings and other mineral deposits. Clean up a bit each day and put things where they belong. Keep your cleaning supplies close by and accessible. Not only does it become convenient, but you can quickly jump on a stain problem before the stain becomes difficult to move. Music - music makes cleaning so much easier. Always clean up after your pets. If you leave it, it smells even if you dont notice it, others do. Assign everyone in the family chores..why should Mom have to do everything!! I pick a room each day to clean this way its not too much to do at once. Bailey Dexter I always clean as I go, this way not a big mess at the end of the week to clean-up on day off! Do a bit of cleaning every day so it doesn't pile up on you. Water down fabric softener and spray on curtains for a fresh scent. I always start at the top and work my way down. My cleaning tip is to not let it get overwhelming and clean smaller areas at a time as you go. Vinegar cleans near everything and is cheap. I clean up as i cook! Do a little bit each day, so the big cleanup on the weekend is not so overwhelming. Give everyone in the family a responsibility so cleaning isn't a big pain. If you are leaving dishes to wash later make sure you rinse them for easier cleaning when you do wash them. Do 10 minute tidies often they make a huge difference. Get lost in some music while you clean, I find it makes it more fun and the time flies while the cleaning gets done faster than you thought. doesn't feel like as much of a chore then! Wash the dishes as you go along when baking. Try to keep things tidy all the time. Put things back where they belong! Use a box/bag/etc if you live in a multi floor house to help relocate things to their correct location. Clean as you go, so you have less clutter to clean up later. Use white vinegar for cleaning it is more natural than some products on the market. Use old newspapers to clean windows instead of paper towels, saves money! clean up room by room, that way you feel some sort of accomplishment. make a list. It is easier if you are organized. To revive a vase of wilted flowers, add a teaspoon of mild detergent. Vinegar is a great cleaning item!! Make a list of chores that need to be done and keep the list posted in a visible place. Update the list weekly and cross of items as they are done. Try using a q-tip for small hard to clean objects and areas - examples: the inside of a keurig (where the cup goes), or the hole in the paddle from a break maker.